We had 53 members, and no guests joining us last month. Welcome Imana, our newest member. The Grounds for Sculpture field trip unfortunately happened on a cold and rainy day, but it didn’t stop Margy and Marika from enjoying themselves. 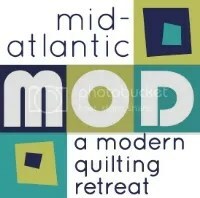 Mid Atlantic Mod is happening. To make things fair for our members we had a lottery for the spots. A lucky 10 will get early sign up. The MQG is raising the dues, which is making us look into our finances. We will be voting on the new budget and dues at the November meeting. Renewal starts Dec 1. Last month we had a challenge for our members. It was the embellishment challenge. And let’s show off some of what we did in Rayna’s classes. We are also asking our members for any ideas for future workshops. For our holiday swap this year, we are changing it up from the normal Elfster swap to a blind exchange. We voted on a reusable tote bag. Charity would like to send out what we have at the end of the year. If you have any blocks for Quilts of Valor, bring them to the November meeting! After the break we showed off our Quiltcon charity quilt blocks. I for one, can’t wait to see it all together! Then it was our favorite time of the night..
Aubrey- I will add more pics after the gifts are given, but here’s a sketch of one. Our next meeting is November 15 at 7:15. Your board meeting up, working hard (and having fun) talking about all the good stuff we have in store!